Typical of the era around 1960 when I was Growin’ Up in Maine, adolescents were familiar with firearms and many hunted small game without adult supervision. My skills with a single shot .22 were particularly deadly, and when not target practicing with my teenage friends, we’d often hunt rabbits or squirrels. Hunting game birds like pheasant or partridge with a .22 was a major challenge, and best done with a shotgun if you could afford one. I couldn’t. To avoid damaging the edible parts, I once took out a partridge with one shot to the neck from 30 feet away. On another occasion, a close friend and I were deer hunting and flushed a partridge. My buddy reacted quickly and pulled up his 30-30, shot from the hip, and hit the partridge in flight from 50 feet away. All that was left were feathers. We were not opposed to hunting varmints, and while we had success, it seemed crows were particularly elusive. One early fall day three of us went partridge hunting deep in the woods on the west side of Derby Hill, and we encountered a flock of crows. I was prepared. This trip I had a 12 guage shotgun borrowed from one of the friends, and it had a minor defect with a loose front wooden grip. The crows were perched high in the canopy, and I claimed first shot as we crept up underneath the tree. I was prepared to bag my first crow as I aimed nearly straight up at the flock and let loose with the buckshot. 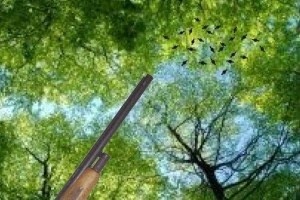 In an instant I was left holding the wooden grip in one hand as the shotgun kicked and the barrel lifted violently. It walloped my forehead knocking me to the ground. I sat dazed for a moment, and then looked up expecting to see black feathers floating in the air. The crows were gone, no feathers, and the only thing damaged was my pride and that lump on the forehead.